A grand jury indicted Winston Nguyen, 30, on Thursday for alleged elder abuse, according to prosecutors. UPPER EAST SIDE — A caretaker and former "Jeopardy!" winner stole more than $300,000 from an blind elederly man and his wife during a yearslong scam so he could treat himself to trips to Florida, meals and ballet tickets, prosecutors said Thursday. A grand jury indicted Winston Nguyen, 30, Thursday on charges of grand larceny, criminal possession of stolen property, identity theft and scheme to defraud, among other charges, according to the Manhattan District Attorney's office. Nguyen, who started working as a health aide in 2009 for the 96-year-old blind man and his 92-year-old wife, lived the high life while siphoning $335,000 from the Upper East Side couple between January 2015 and May 2017, prosecutors said. Nguyen — whose social media profiles featured him taking lavish trips to far-off locales like Paris and Antwerp — used the couple's bank account and credit cards from American Express, Bank of America, Citi, Wells Fargo for $100,000 in purchases, prosecutors said. He also opened two Chase credit cards with their personal information to get more than $35,000 in credit and then wrote himself $200,000 in checks, officials said. Nguyen went so far as to have their bank statements sent to his home and showed the couple fake statements that didn't include his purchases, prosecutors said. He also blocked phone calls at their home so creditors couldn't reach them and made an email account to impersonate the couple's son so he could deal with their condo board, according to court records. Nguyen, a big supporter of the New York City Ballet, used the stolen cash to buy ballet and Broadway tickets, hotel rooms, meals and plane tickets for multiple trips to Florida with friends, prosecutors said. It wasn't until the couple's daughter-in-law discovered fraudulent charges on their credit cards that police were notified, officials said. Nguyen, who won more than $11,000 during a September 2014 episode of "Jeopardy! ", was released without bail after pleading not guilty Thursday, prosecutors said. His attorney did not immediately return a call for comment. 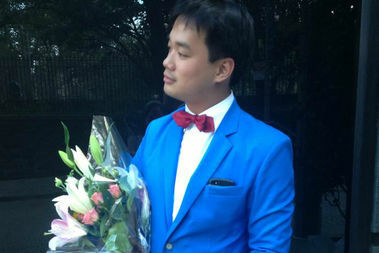 Nguyen grew up in Houston and studied at Columbia University, according to his Facebook profile. Victims of elder abuse lose more than $36 billion a year, according to Manhattan District Attorney Cyrus Vance Jr., who announced the indictment on Thursday. “Sadly, the true cost is likely higher as elder abuse is often unreported," he said in a statement.